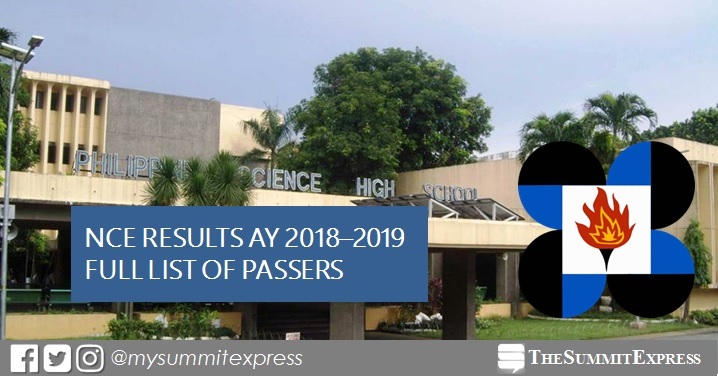 MANILA, Philippines – The Philippine Science High School System (PSHS) officially released on Tuesday, December 19, 2017, the results to include the full list of passers of the October 2017 National Competitive Examination (NCE) for academic year AY 2018-2019. The examination was conducted on October 21, 2017 in 134 testing centers nationwide. Fortunato dela Pena, the Secretary of the Department of Science and Technology (DOST) and Chair of the PSHS System Board of Trustees, announces the names of the successful qualifiers for PSHS Search for Scholars for 2018. Of the 26,413 applicants, 1,361 successfully hurdled the one-step screening. Results were announced through DOSTv livestream video on YouTube. Watch out announcement of NCE results at 23:26 of DOSTv video or see full list below. Screengrab of partial list of NCE passers. See full list through livestream video below. 'Pisay' advised the qualifiers to IMMEDIATELY contact the Registrar or the Campus Director of the campus where they are qualified to enroll, or visit the following websites: www.pshs.edu.ph or www.dost.gov.ph, for more information on early enrollment. Deadline for slot confirmation / reservation of principal qualifiers for Main Campus qualifiers, and on for regional campus qualifiers will be announced soon. NOTE: Specific schedule of other enrolment activities shall be announced by the respective campuses. The NCE is a scholastic aptitude test designed to measure Scientific Ability, Quantitative Ability, Abstract Reasoning and Verbal Aptitude of applicants, according to the Department of Science and Technology. PSHS is a service institute of DOST, offering free scholarships for high school students who will likely take up a Science career after graduation.